From left, Sen. Barbara Boxer, Supervisor Mark Ridley-Thomas, Rep. Diane Watson, Rep. Jane Harman, Rep. Maxine Waters and L.A. Mayor Antonio Villaraigosa. Photo by Luis Inzunza. As many of you already know, Senator Barbara Boxer announced last Friday that the federal loan would help speed the building of the Crenshaw/LAX light rail line, with work beginning as soon as 2011. The project was originally scheduled to be completed by 2018 in Metro’s long-range plan, but Metro officials say the loan may — emphasis on ‘may’ — make it possible to complete the project by 2016. The loan is certainly a big deal, but what makes the federal money more compelling is that it’s now clear that the Obama Administrations backs the thrust of the 30/10 Initiative, the Metro policy to seek federal loans and other financing to build 12 Measure R transit projects in the next 10 years instead of the next 30. The loans will be repaid with Measure R tax revenues, which flow into local coffers over a long time. The loans and federal help would make it possible to start work now, rather than wait for the revenues to show up. The event Wednesday morning to formally announce the loan was held in Leimert Park, a few steps from where the light rail alignment would run. Not surprisingly, a large contingent of public officials attended, including Sen. Boxer, Los Angeles Mayor Antonio Villaraigosa, Supervisor Mark-Ridley Thomas, Supervisor Zev Yaroslavsky, Rep. Diane Watson, Rep. Jane Harman and Rep. Maxine Waters. Also in attendance was Los Angeles County Federation of Labor executive secretary-treasurer Maria Elena Durazo. Under Secretary Kienitz told the crowd that the loan came from discretionary funds that his agency uses for interesting projects around the country — and that both the Crenshaw/LAX line and the 30/10 Initiative qualified as such. He also said that 30/10 couldn’t be done overnight and would need some existing law changed by Congress as part of the next federal transportation bill. “I hope this is not the last time we get together and do something like this,” he said. I later asked him if other parts of the country were aware of 30/10 and how it might help them. Kienitz said the program is well-known in transportation funding circles but that one reason he attended the event today was to help promote to other regions how 30/10 could might help them complete transportation projects. •Boxer, by the way, was widely credited by every speaker for her hounding of the U.S.D.O.T about making the loan. 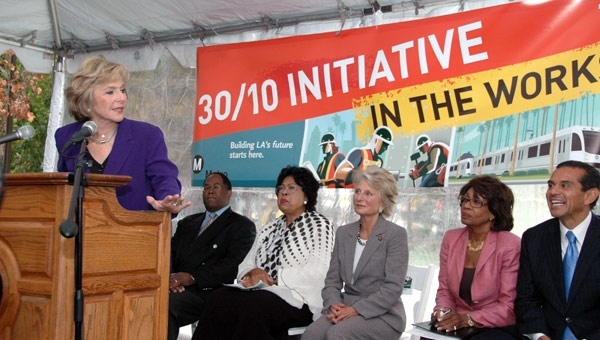 •”It’s the first step in realizing the 30/10 Initiative,” said Mayor Villaraigosa. •”Today’s announcement means that that people will be employed, will be able to get to their jobs and will continue to be able to pay taxes to help government run,” said Rep. Diane Watson. •”Do you realize what this project will do to spur development of this community?,” asked Rep. Maxine Waters, pointing out that the Crenshaw corridor is lined with many small businesses that have been hanging on through hard times and need a boost. Metro officials today applauded the U.S. Department of Transportation (USDOT) announcement of a low interest loan of $546 million for the Crenshaw/LAX Transit Corridor project, representing the largest public works investment in South Los Angeles. The $546 million loan from the federal Transportation Infrastructure Finance and Innovation Act (TIFIA) program will help get construction underway for the Crenshaw/LAX Transit Corridor project in the Crenshaw District, which will connect to the Metro Green Line and the Expo Line, currently under construction, eventually, providing direct train service to a planned LAX transit center. Metro is currently preparing environmental documents and soon will begin preliminary engineering. Construction could start in late 2011 and be completed in the 2016-2018 time frame. Today’s announcement is a major step forward in funding the 30/10 Initiative, the Metro Board approved policy that seeks to build 12 Measure R transit projects in the next 10 years instead of the next 30 years by using federal loans and other financing. “This loan money will be spent to get the project going, creating thousands of jobs and millions in economic development opportunities once completed – funding that will help jump start the economy and put people to work,” said Knabe. The Crenshaw/LAX Transit Corridor Project calls for construction of a new 8.5-mile light rail line to extend between the Exposition Line at Exposition and Crenshaw Boulevards and the Metro Green Line LAX station. The project connects downtown Los Angeles, West Los Angeles and the South Bay, and provides critical linkages for the region’s residents, employees, and national and international visitors. The alignment is a combination of at-grade, below-grade and above-ground sections. Six stations are proposed at Exposition/Crenshaw, Crenshaw/Martin Luther King Jr., Crenshaw/Slauson, Florence/West, Florence/La Brea, and Aviation/Century. Two optional stations at Crenshaw/Vernon and Aviation/Manchester are being studied. In addition to the rail line, the project includes development of a maintenance facility with four sites currently under consideration. The Los Angeles County Economic Development Corp. estimates that the rail line will generate approximately 15,100 jobs directly related to the project both created by Metro and project workers that will spend money in the economy. The total capital cost of the project is $1.470 billion in 2008 dollars. The TIFIA loan will be repaid by using Measure R half cent sales tax monies approved by LA County voters in 2008. For information on the Crenshaw/LAX Transit Corridor Light Rail Project visit Metro’s website at www.metro.net/crenshaw. Happy first birthday to The Source! Given the climate in DC these days, its great to see at least this bit of the 30/ 10 money. If no more loans are forthcoming, is there any way for the county to sell bonds tied to measure R money? Say, borrowing enough to do the subway and the regional connector on an expedited schedule. We’re in the middle of a massive global debt bull market (the government of Mexico just sold 100 year bonds!). I’m guessing that the law would require another ballot measure (with 67% support), and so its unlikely to happen. For myself, I’d vote for 2 cent increase in sales taxes right now! Good question. Under Measure R, the county can sell bonds to help build the projects — and, in fact, Metro intends to do so. But I don’t believe it’s possible to raise enough money through bonds (which, of course, come with interest to be repaid) to expedite the projects. That’s the appeal of the federal programs — loans, bonds, etc., but with lower interest rates. As a long-time resident living in the Crenshaw District, this is fantastic news! I applaud all those involved with securing funding for this major project that will benefit the community, bring jobs to our area and increase transportation options for the residents. My question is regarding jobs and contracts that will be made available to the public. How and when will we learn of such opportunities? I am a partner in a small PR firm with an extensive background in reaching out to the African American and Hispanic Markets. As a 35year resident in the area, I know this community. How can our company assist MTA with keeping the community informed about progress, opportunities, alerts, etc. via a comprehensive PR plan and strategies?